I feel lucky I got Carl Zeiss Jena Fernobjektiv as Christmas gift to myself, this lens is very rare in any condition with any mount, but my copy is almost MINT and it has NIKON mount. This means I have an other ultra rare lens in my collection. It's long barrel length not allowes a comfortable shoot from hand. This lens is not as heavy as expected, but with a monopod it is pretty comfortable to use and take sharp, excellent pictures. With normal tripod it can be a good competitor for any modern lenses. I don't think so I will bring this lens to shoot wildlife, because it's too rare, I keep it as one of the most valueable pieces in my collection. Perhaps I will buy another one and will shoot with the other copy. 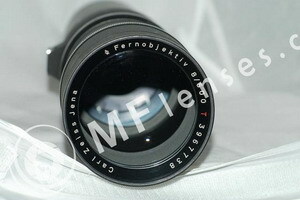 Color rendering, sharpness just excellent, better than Pentacon 500mm. I've just read your interesting and informative note. Yesterday, I've been lucky to find one for me, in the 42x1 mount. My piece has the serial no. 3967729, so, it was assembled 9 pieces earlier than your fine one.